I do not remember if I ever mentioned this project and that I did participate… continue to participate. A guildmate and I get together most Sundays to work on our mystery quilts. 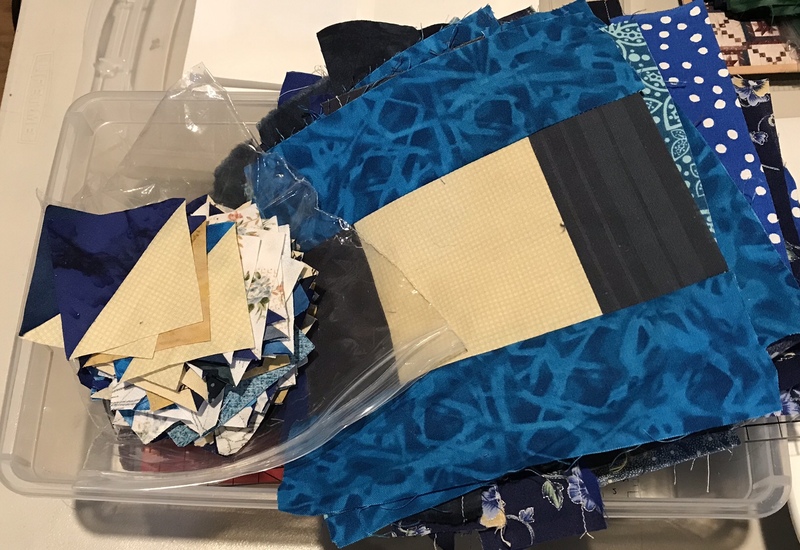 Originally it was supposed to be Bonnie Hunter’s Good Fortune Quilt but she decided to work on a different mystery quilt. 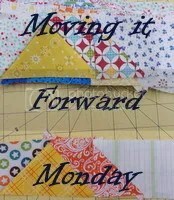 Meeting like this really helps to get me back into my quilty mode. I just started with clue 1 and I worked on that until it was done. Then I started with Clue 2. I’m still working on clue two but I will probably be done with it pretty soon. 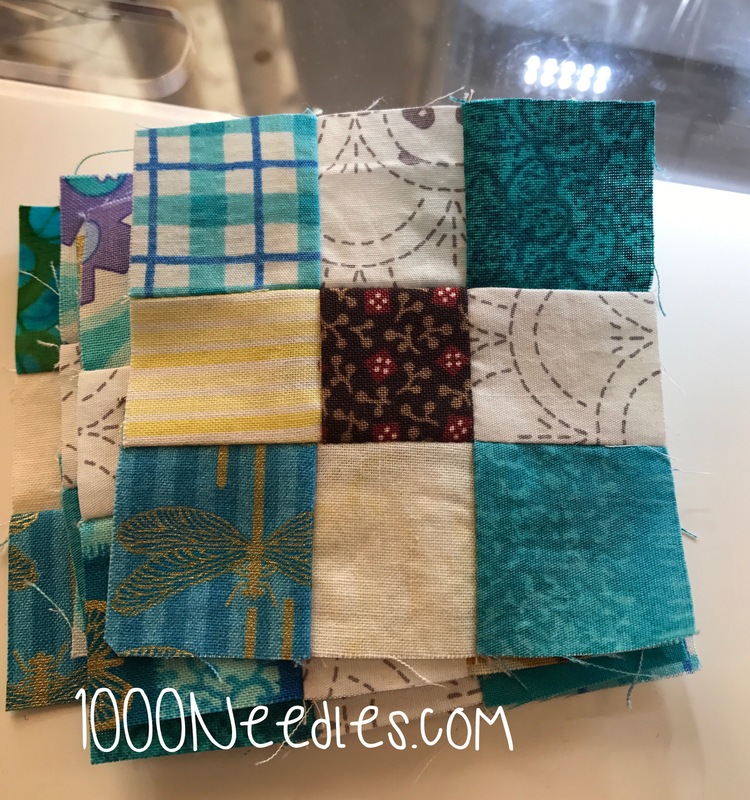 I’m using the square in a square method and it took me a while to figure out how wide the blue borders and the center square needed to be to get the right measurement of my HSTs. 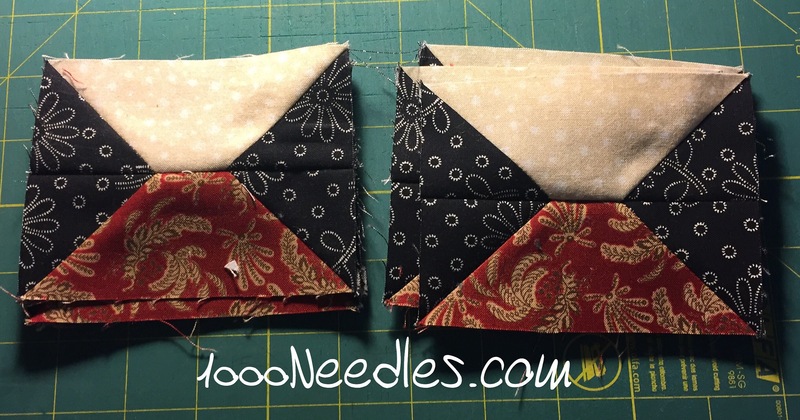 The center square needs to be about 4″ square and the borders are about 2″ wide. The squares have to be accurate but the borders didn’t have to be exactly 2. If it was a little small or big it would still work. 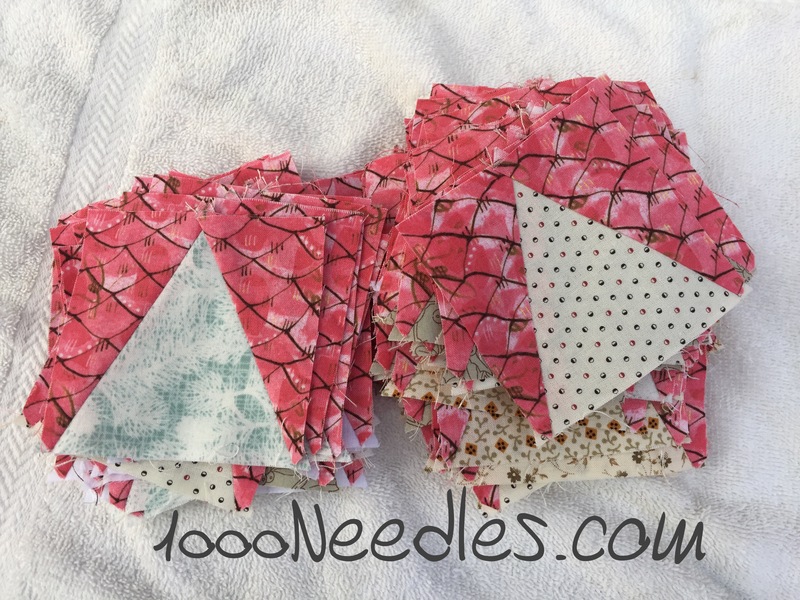 This was a really fast method and my HSTs are perfect. Hopefully, it will be done this week and I can get started on Clue 3 next Sunday. By Sunday evening I had about 35 of these flying geese done. I hoped to be further along but with all the other things going on, I’m happy to have gone a bit done for this clue. Hopefully I’ll be able to get a handful taken care of this week before clue #3 is released. 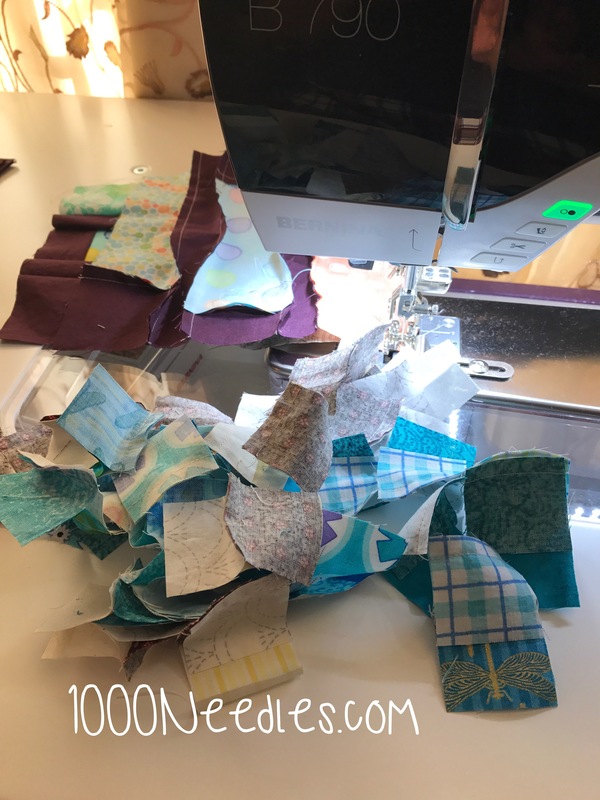 In regards to Clue #1 – I had cleaned up my sewing table and covered my sewing machine with the intention of going back in to do the remaining 18 I had left of Clue #1 but didn’t get around to it. I think because it was cleaned up and covered. So for Clue #2, I left all my pieces on my table and my sewing machine uncovered. I hope to do a bit each day just to get some of the clue knocked out. What a way to get myself picked up and out of this quilt slump. And even better that the first clue is doable and not a hundred pieces of x. This year, as with last year, I looked at the colors Bonnie selected and I didn’t buy fabric for this QAL. I opted to pull from stash. And I chose to do so Friday morning once the first clue was released. Since we were doing 1 and a half inch squares, I started with my small stash bin. This bin contains anything less than a quarter yard. In actuality they’re usually scraps cut from other projects strips or things I’ve gotten from other places. Anyway, I went through this bin first and pulled out browns, creams/whites, and turquoises. Then I cut and pieced as many of the 9 patches as I could. I came out with 8 complete 9 patches. The rest of Friday I spent going through another larger bin labelled “fat quarters and smaller” and pulled anything turquoise and cream/white. I had cut enough brown squares from the first bin so I didn’t need any more brown. I’ll probably need more for the next clue but I’m sure I’ll be going through the bin again. If I run out and need more I’ve got another bin labelled “fat quarter to 1 yard”. and then I’ve got more bins that are full yardages and then a couple of bins labeled “2+ yards”. 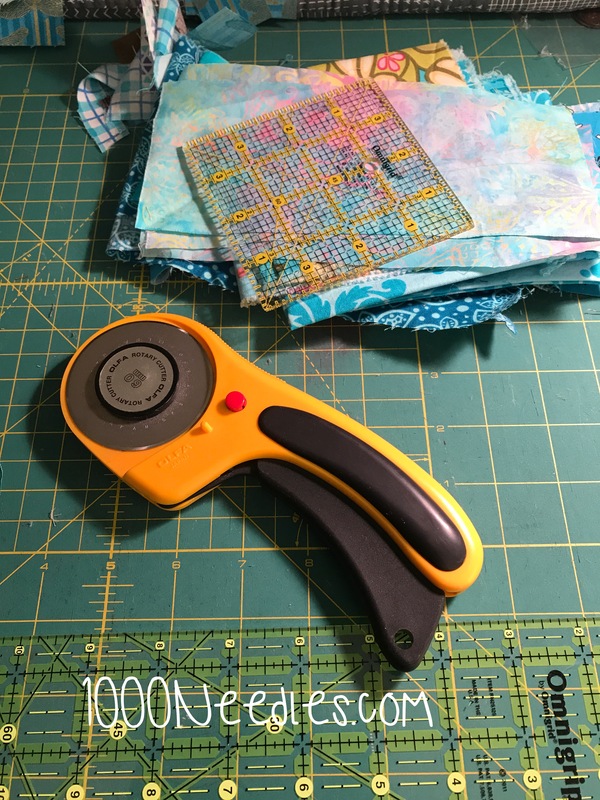 The best part of scrappy quilts is the feeling of using up these smaller fabrics, making room and then going to the bins with the yardages and making more room. I forgot about this feeling and I’m excited with quilting again! By Sunday evening I had 32 patches done. I hope to have the remaining 18 finished by Thursday. This year, we stayed home and kept things easy. It seems that as I get older I’m all for easy. We ordered everything from Claim Jumpers and Kayla decided to make candied yams and Jacob wanted to make pumpkin pie. Both came out surprisingly tasty. But the hard stuff – turkey and ham – came already made so nothing for me to stress about on my end. 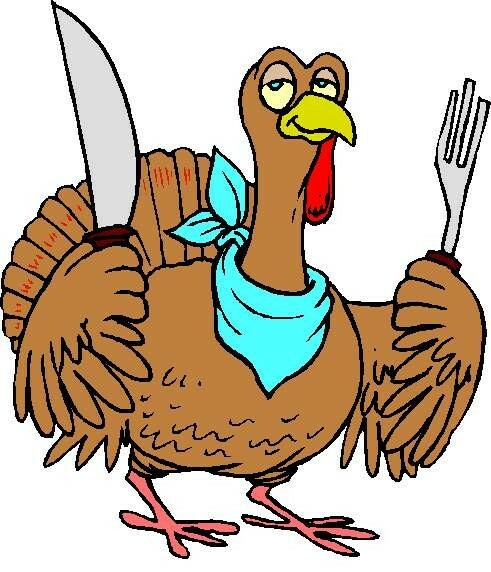 I did buy a turkey and I’m baking it today, Saturday, so we can have turkey everything over the next few weeks. I know, it’s weird. But it works for me so that’s how I do it. I remember my mom doing the same when we were younger. A huge turkey on Thanksgiving for the big family gathering and a smaller turkey just for us to enjoy over the next few weeks. 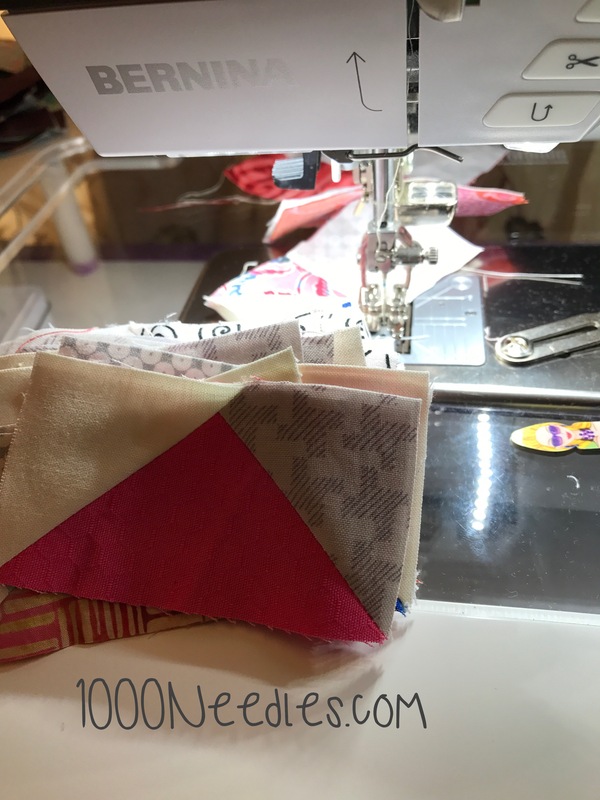 I spent the holiday break crafting on my projects and spent Black Friday on the first clue of Bonnie Hunter’s mystery QAL (Quilt-a-long). There’s only 50-9 patches so I hope I can get those done by Monday! It’s mystery time! On Ringo Lake is coming from Bonnie Hunter! It’s that time of year again! 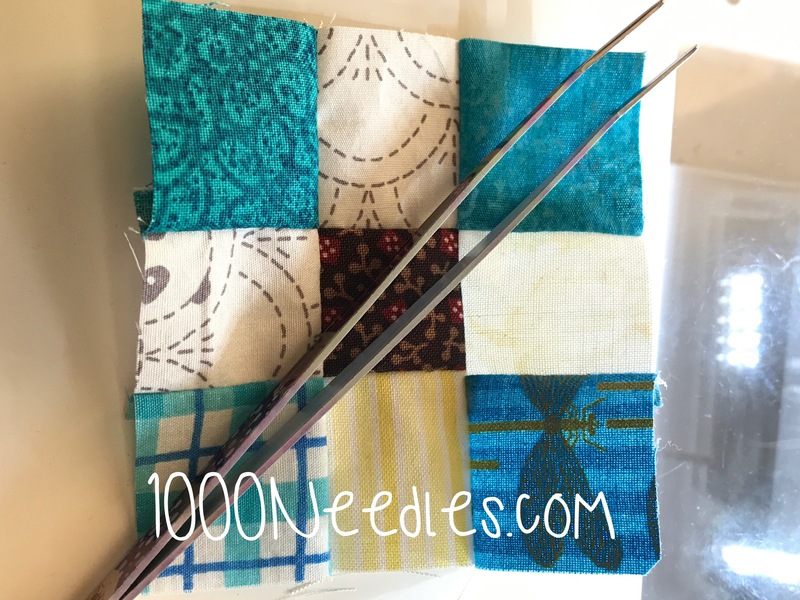 Who’s doing Bonnie Hunter’s mystery quilt this year? Every year I tell myself NOT to do the mystery because I’ve still got 3 of them hanging out in various stages in my WIP/UFO piles. And every year I get super excited as Black Friday approaches. I look forward to spending the next few weeks putting cutting and sewing hundreds of pieces together. I look forward to the community and the peacefulness of chain piecing. 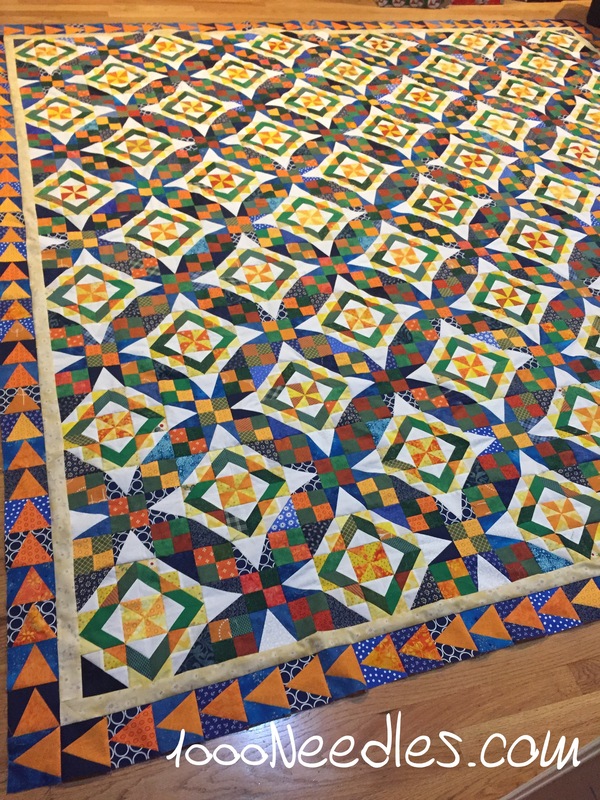 I’ve participated in Bonnie Hunter’s mystery quilts for the last 5 years. The top is done but I still need to get the back together and then I need to quilt it. 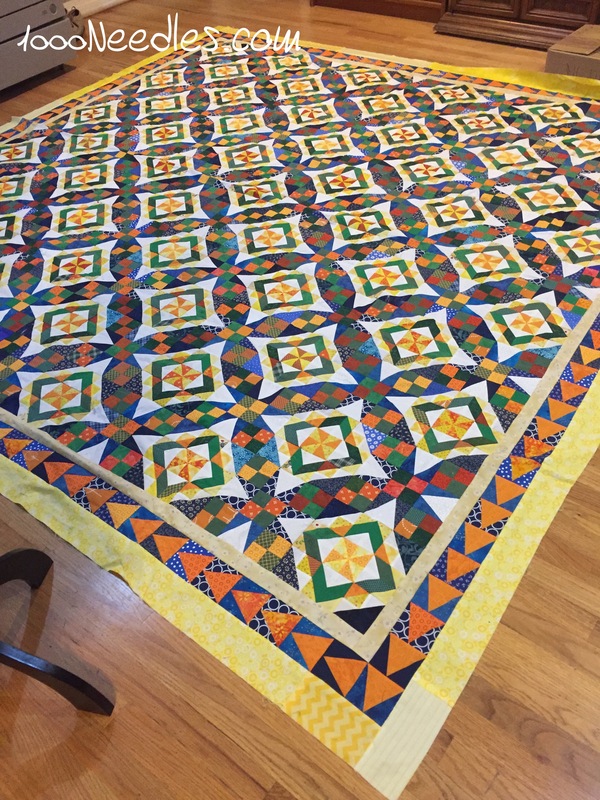 This is a LARGE quilt at 115″ x 115″. I think it is too big for the long arm I usually rent over at Baron’s. So I’m debating whether I should send it over to the quilter. It’s going to cost a lot and that’s why I’m hesitating on getting that finished. I frogged the mystery quilt from 2014, which was Grand Illusions. I admit I didn’t like how this one turned out. That’s okay. Everyone doesn’t have to like everything. I liked the previous 2 and I liked the last 2 so I frogged it. I was sad about the fabric but I’ve let that go. Allietare! was from 2015 and I haven’t worked on it since 2015. I love how it turned out and I love the little bit of work I did on it. So it’s hanging out until I get to it. En Provence – was last year’s mystery and I’ve got these separated in 3 bins. I can’t remember why but like Allietare I loved it when it was revealed and I love the work I’ve done so far. And so it’s waiting for me to spend time with it. Missing Ivy – I need to prep this for my visit with the long arm. I took the batting out of the package and it is airing out the creases. I hope to be able to trim it down to the size I need. I also need to trim the backing and press the top and the back. 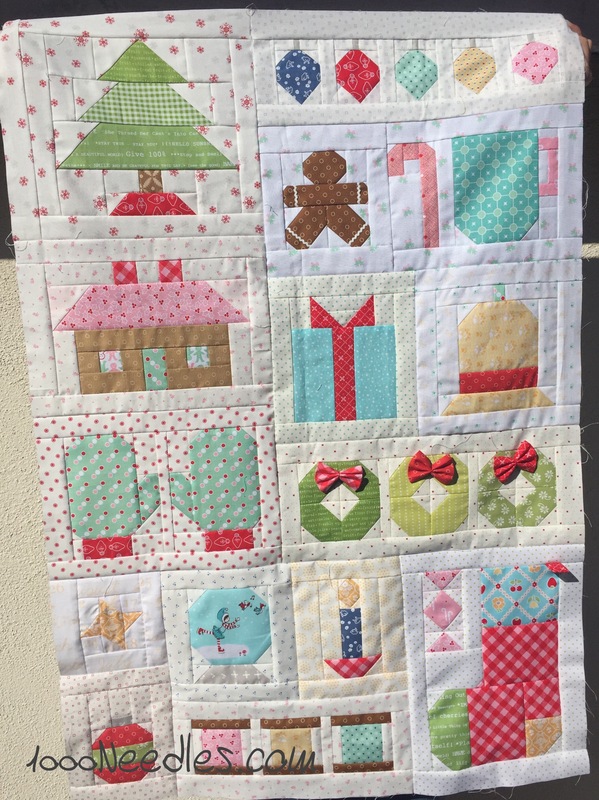 Have yourself a quilty little Christmas – Finish the border on this top. This is almost done and I hope to finish it this week. Zipper pouch – I want to watch the zipper pouch class (I believe this is a free class on Craftsy) and possibly put one or two together. Celtic Solstice – Woohoo! Finished top! This quilt is so big that I can’t get a good picture of the entire thing. It’s wet and overcast outside so I could not get a picture outside over my wall. Oh well. Next step is to get the back in order. 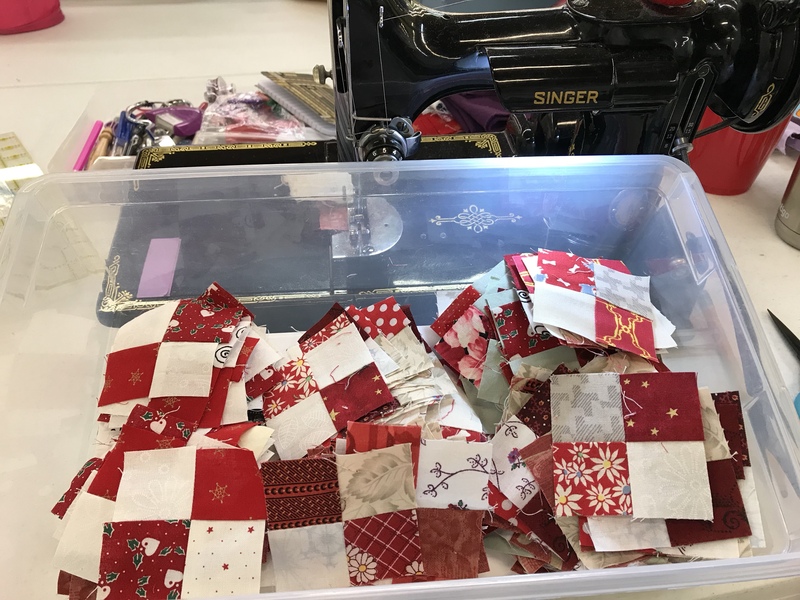 That’s not something I’m looking forward to so I’ll continue working on the border of Have Yourself a Quilty Little Christmas. Celtic Solstice – more progress! I have 2 sides of the final border attached. I’m working on the other 2 sides this week and then I can start getting the back together. It’s overcast again but as soon as I took this picture and took the quilt back inside the sun came out! Oh well. Hopefully the sun cooperates when this top is finished! I know the next step is to work on the back but I think I’ll take a break from Celtic Solstice. 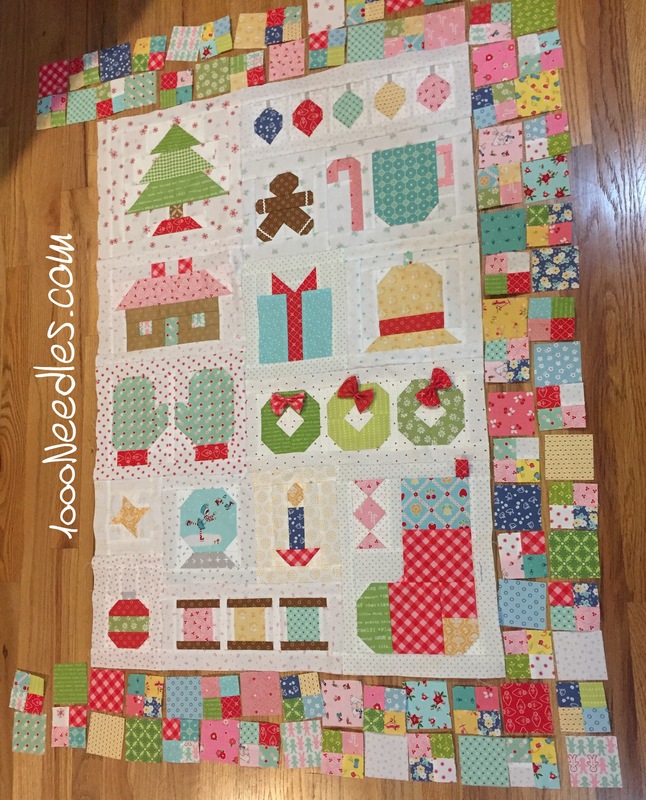 I will pull out Have Yourself a Quilty Little Christmas and start working on the borders. Celtic Solstice – I know I keep showing this picture…. This was taken on the floor of my living room. The colors show up so much better than the pic above outside by the pool. It didn’t help that it was overcast on 1/22 but I love how the quilt is coming along. I’m onto the third and final border. 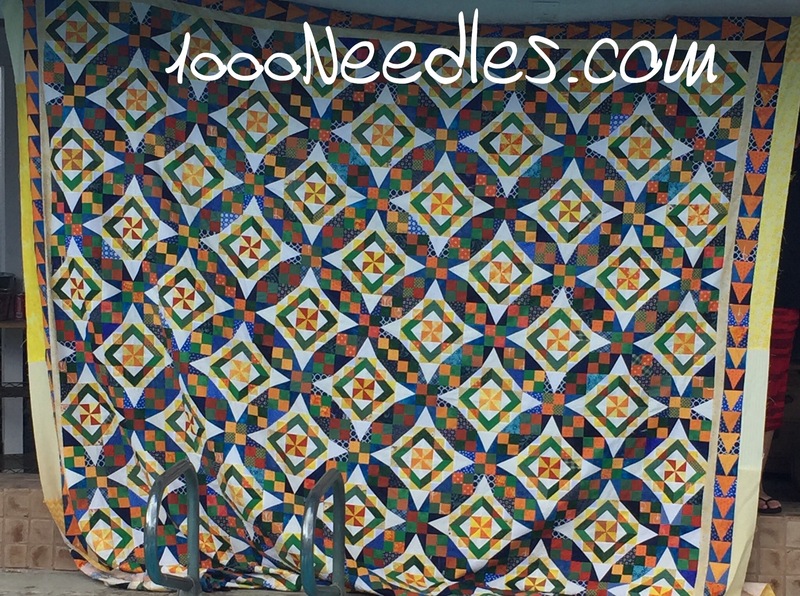 The pattern I got from Bonnie in 2013 says that the final border should be a neutral. I have a feeling that that is wrong and was probably corrected after I retrieved the final instructions. 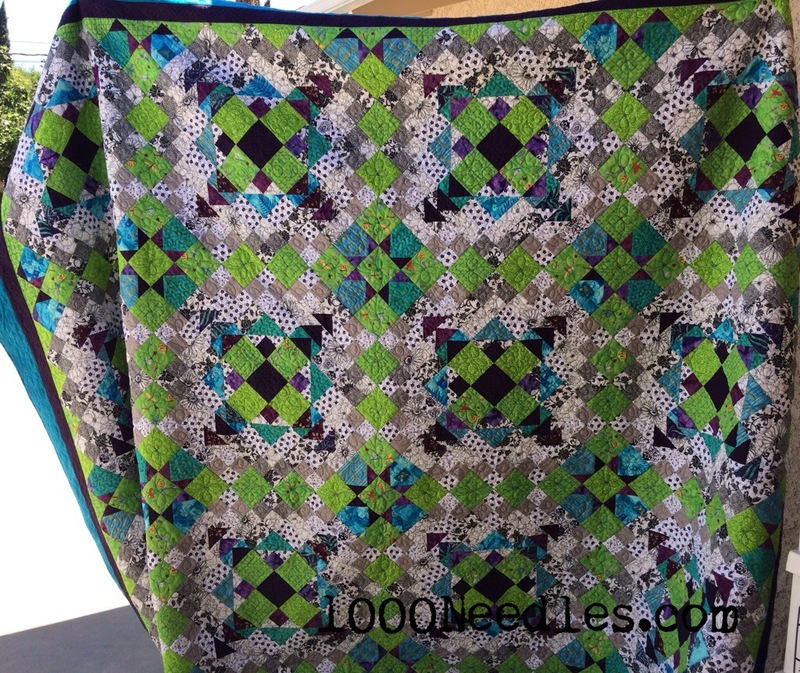 The reason being that the picture of the final quilt on the instructions has the final border as being green. 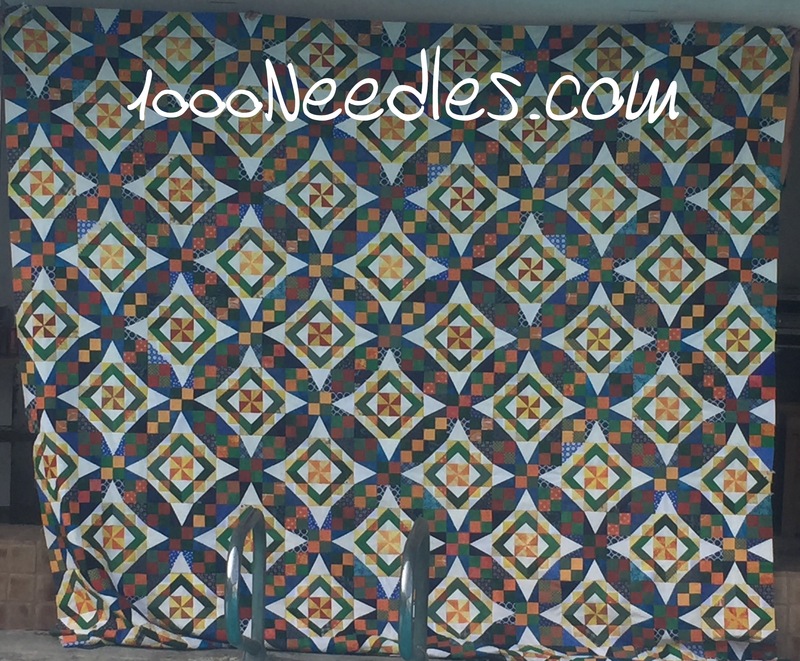 A quick google search showed me that different quilters used different colors for that final border. I’m going to have to go through my stash and figure out what to use for my final border. 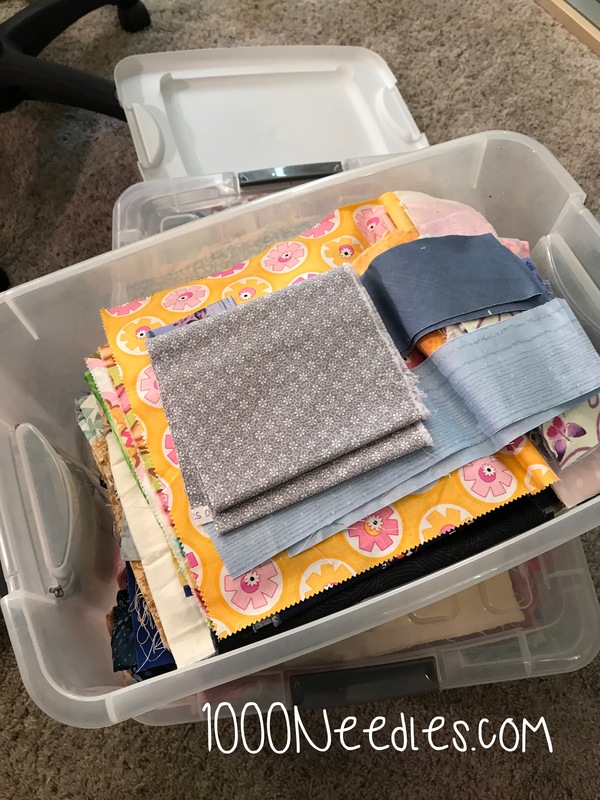 I’ve got orange, yellow and blue fabrics put away in my Celtic Solstice box and I plan to try those out before diving into the stash bins. I have a feeling I’m not going to love them but I won’t know for sure until I lay them out to try. Once this top is done, the next step is to piece a back for it. Then I can set it aside until I’m ready to rent the long arm and quilt it. Celtic Solstice – I finished the inner top last week and I’m working on the borders. I’m just working on Celtic Solstice right now and I’ve got one of the steps for Scrapitude 2016 as my leaders/enders. That’s it and it’s slow because I do not have time during the week to work on borders. I generally only do them on the weekend. It’s kind of why I’ve gotten so much done on my knitting.